9 Ways To Keep Your PC Cool | GUI Tricks - In Touch With Tomorrow! 9 Ways To Keep Your PC Cool - GUI Tricks - In Touch With Tomorrow! With every passing year, PC hardware manufacturers are making their components more fast than ever before, and this causes more power consumption by these components (like CPUs and graphics cards). But power consumption isn't the only issue here. Heat is a by-product of power consumption, and your PC can get very hot if it's consuming a lot of electric power. Overheating in a PC can cause some severe problems such as data lost, unexpected shutdowns, or even permanent hardware damage. That's the reason why in this post, we'll talk about 11 ways your can prevent your PC from overheating. A dusty PC is the first and the most basic cause of PC overheating. It's because the dust settles in your PC with the passage of time. This dust goes into vents and fans too, and doesn't allow hot air to pass out of your PC. This subsequently raises your PC temperature. Clean every fan present in your PC, such as CPU fans, external fans, Graphics card fans (although they're a bit difficult to clean), and power supply fans etc. To remove the dust off these fans, use compressed air cans, and then clean them with clothes, and then with isopropyl alcohol. As far as other parts of your PC are concerned, try cleaning them with simple clothes. Placing too many things around your PC can lead to insufficient airflow, which in turn can increase your PC temperature. That's why remove all the clutter that's been placed around your PC. By default, many manufacturers keep the CPU/GPU fans on low speed. If your CPU fans are running on low speed, there's a real chance that your PC will produce much more heat. In case you want to customize your fans' speed, you can do so easily with the help of programs such as SpeedFan, and Afterburner by MSI etc. But there are some downsides of having fans running at high speed (such as extra noise). Almost all the cooling fans that come with the PC are small and not-so-powerful. So, it's better to buy a bigger and better CPU cooler. You can buy a decent one for less than 50 bucks on any online store, like Amazon.com. Most people don't properly manage cables of the internal PC components (like graphics card and powers supply), and this thing gives them a lot of headache in the long run. Since messed-up cables take a lot of space in your PC, they contributes to dust collecting in your PC, and overheating eventually. Yes, cable management require removing and plugging-back cables into almost every one of your PC component, and can be very time consuming. But, once you've completed it, your PC will have better airflow and will look better too. The reason why you should apply (or reapply) a good quality thermal paste, is because it transfers the heat from CPU/GPU to the heatsink more efficiently. A poor quality thermal paste will stop working after a few months. That's why you should prefer quality over price in this scenario. One thing you should note is that you should apply thermal paste carefully. In case you do anything wrong when reapplying thermal paste on your graphics card, the company will not compensate you because re-applying the thermal paste voids graphics card' warranty. In case you want some hints, here's a tutorial on how to apply thermal paste. Many people think that they will get better airflow if they keep their PCs open. But they really ignore one big piece in this puzzle: The dirt. If you keep your PC open, more dust will collect into your PC, even more faster than when it does so in closed PCs. This will make your fan slower in a relatively short period of time. That's why there's really no benefit whatsoever in keeping your PC open. Many PC manufacturers allow you to change fan speed settings, and many other things like that, through your BIOS settings. So, go to BIOS menu and optimize those settings to have a cool PC. If all of the above-mentioned methods fail for you, then water cooling is your last resort. 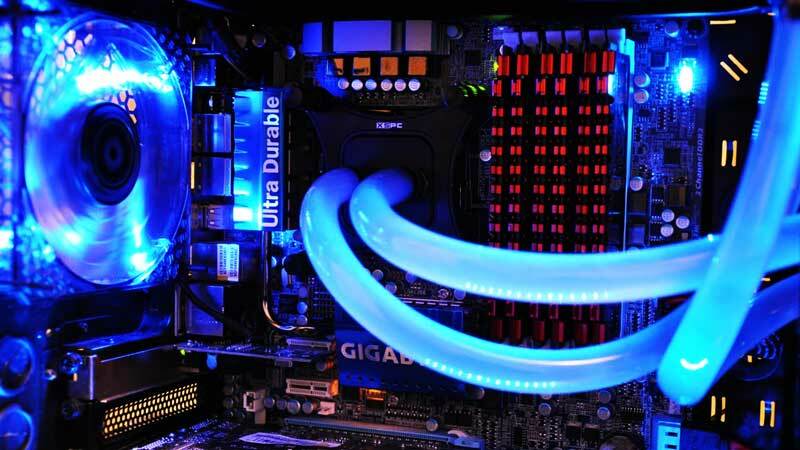 Water-cooling (also called liquid cooling) makes your PC more cooler than the standard air-cooling. This is the reason gamers who overclock their CPUs and graphics card, simply love it. So, you should consider it if you want a normal CPU temperature as well as extra performance. Yes it's expensive, but looks and performs better than the traditional air-cooling. So these were some of the best tips to prevent your PC from overheating. Do you know about any other tip that we forgot to mention in this post? If the answer is yes, then feel free to comment below.